April 29, 2017 By Elizabeth Lindemann 6 Comments / This post may contain affiliate links. If there was ever a match made in heaven, it’s brussels sprouts and bacon. 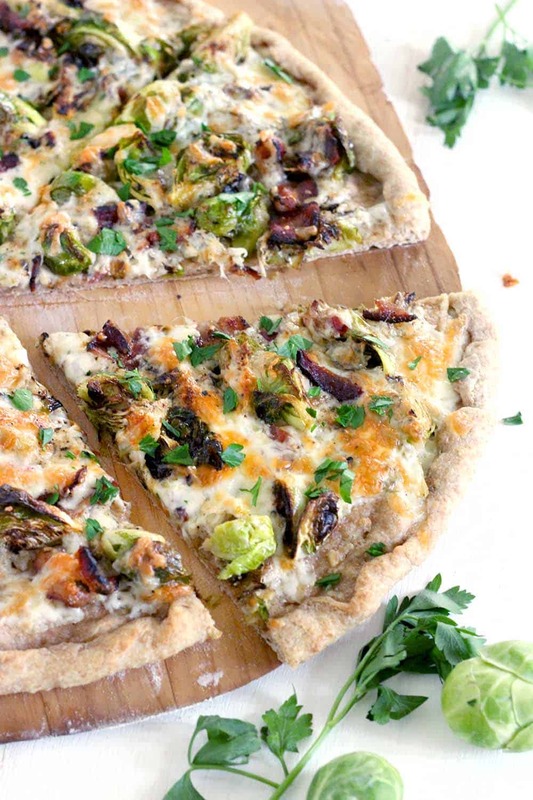 And this Brussels Sprout and Bacon Pizza is the PERFECT way to enjoy the combination. A white pie with a whole wheat crust and only FOUR INGREDIENTS?! Yes, please. I’m going to be a total cliche American/pre-teen child right now: my favorite food is pizza. That’s it. It has to be. It’s cheap, simple, quick, and versatile. You can take literally ANY combination of food- even desserts– and make it into a pizza. And when you make it from scratch at home and use whole wheat pizza dough, it’s a fairly healthy thing to eat despite its reputation. I like my pizzas simple. I wanted the flavors of brussels sprouts and bacon to be the stars of this meal, so it’s a white pie with simple mozzarella cheese. It only has four ingredients- pizza dough, cheese, brussels sprouts, and bacon- plus olive oil, salt, and pepper. Here’s what makes this recipe so scrumptious. The bacon is cooked first and then crumbled. The brussels sprouts are cooked in the same skillet IN the bacon grease (you’re welcome) to make them extra smoky and infuse the flavor as much as possible. Then, the sprouts, bacon, and half the cheese are mixed together before adding to the pizza, ensuring an equal distribution of flavors. The rest of the cheese is sprinkled on top (rather than placed on the bottom) to ensure a bubbly, melty, browned topping. AND (this is important), I used a cast iron pizza pan to cook it. This is my new favorite way to make pizza at home. I’ve tried a pizza stone, I’ve tried a rimmed baking sheet… this is the way I’ve had the most success making a pizza with a crispy crust at home without it falling apart and making a mess. If you don’t have one, you can use a cast iron skillet (the pizza will be smaller with a thicker crust and denser toppings), or you can certainly use a baking stone or sheet. If you love making pizza at home, I highly recommend buying one. It’s preheated in the oven, removed, and the pizza is assembled on top, giving the crust some extra time to cook before placing it back in the oven to finish. I like that it has handles, whereas most baking stones don’t, making it easy to move in and out of the oven. 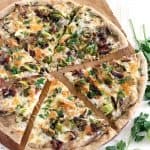 If you like the idea of brussels sprout and bacon pizza, try this sausage breakfast pizza! It’s another one of my favorites. 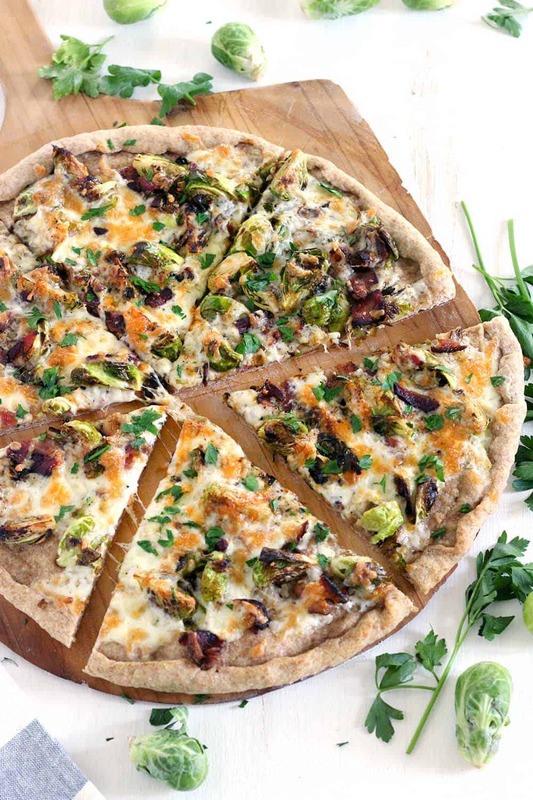 Brussels Sprout and Bacon Pizza is a match made in heaven and a FOUR INGREDIENT recipe! 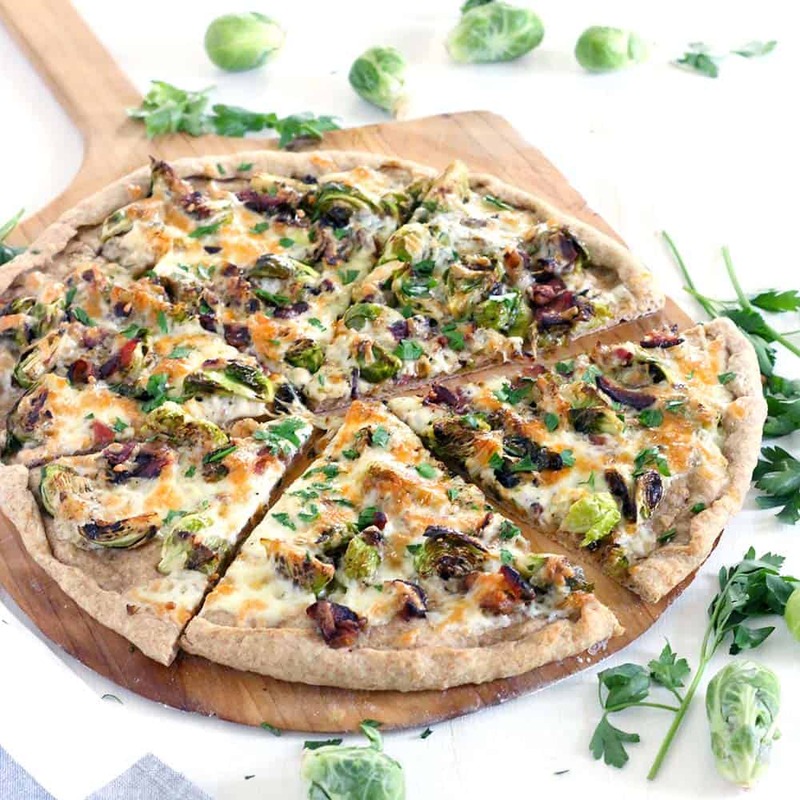 A white pie with seared brussels sprouts, crunchy bacon, and mozzarella cheese baked on a cast iron pizza pan until bubbly with a whole wheat crust. YUM. Place cast iron pizza pan (or baking stone/sheet) in oven and preheat to 500 degrees F.
In a cast iron or other heavy skillet, cook bacon over medium high heat until crispy. Remove and place on paper towels to drain. Chop roughly when cooled. Add brussels sprouts and salt and pepper to the skillet (in the bacon grease) and cook over medium-high heat until seared and tender (about 5-7 minutes). Meanwhile, roll out pizza dough and place on a floured pizza paddle. Drizzle top of crust with olive oil. Remove pizza pan or stone from the oven and place the crust (carefully!) on top. Mix together 1/2 of the mozzarella, chopped bacon, and cooked brussels sprouts in a small bowl. Spread on top of crust. Top with remaining mozzarella. Place pizza back in oven and cook for another 7-10 minutes, or until cheese is melted and beginning to brown. I was looking near and far for a winter pizza of the kind I remembered eating during Carnivale in Rome. … and your recipe is just what I was searching for, although i’ve made the addition of smearing roasted garlic across the crust, which i parbake for three minutes since i am without cast iron. Thanks ever so much for sharing! WOW!! Amazing. I made this pizza for my husband and I tonight and when he first tasted this, his eyes lit up! I followed your recipe, with no extra additions, and it was wonderful! Thank you for sharing this easy and delicious recipe. Yours is so special. I have never eaten pizza brussels sprouts before. Pizza is also my son’s favorite. Will try to make it following your recipe. Nice share! This is so good ! I have never thought of making pizza using brussels sprouts! Thank you so much !